The following gigs have all taken place. For news of upcoming concerts, please see the latest reunion news from the blog. Sunday 6th April 2003. This was recorded by the BBC and broadcast on John Peel’s Radio 1 Show and on Radio 3’s ‘Mixing It’ programme. See ATP photos taken by Janet The Planet (Denny Walley’s wife). Above ticket and press ad kindly sent along by Benjamin Horrendous. USA, All Tomorrow’s Parties, Long Beach, California, Queen Mary Ship. 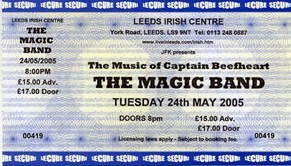 28th June 2004 – there had also been a show scheduled for 29th June which was cancelled. 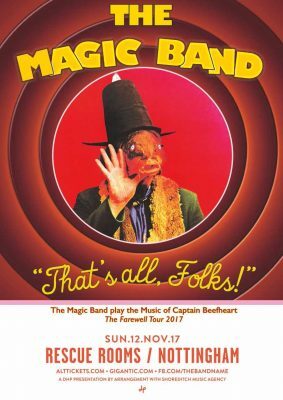 When it looked like we wouldn’t see the Magic Band tour again they were offered another spot at the UK All Tomorrows Parties event at Minehead in November 2011. 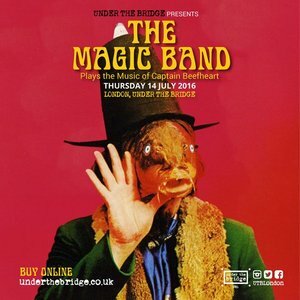 The band decided to try to put a short tour together around that gig and started approaching venues across the UK. Some already had full schedules while others offered paltry money … but there were enough to make a tour worthwhile. Then, suddenly, the ATP event was postponed until March 2012. 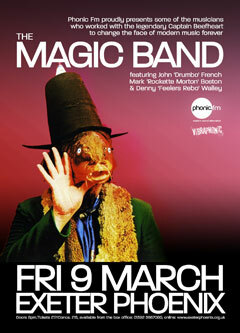 A replacement show in Bristol was hastily arranged to fill the date and the tour went ahead. And what a tour it was … the band were on blazing form. 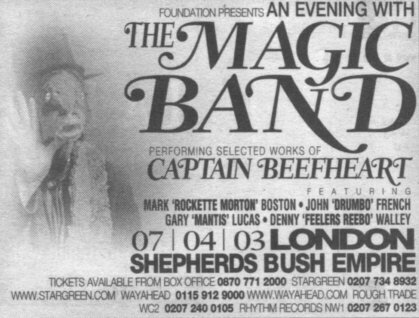 With Denny Walley leaving the band and Mark Boston still recovering from heart surgery it was a different looking, and younger, band that toured this time. Having been invited to play at Zappanale #27 the band were able to fit a quick one-off UK show before flying out to Germany. 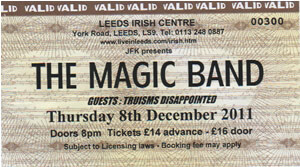 Billed as ‘The Farewell Tour’ this might well be the last time we see the Magic Band touring in the UK.